The stay for Moise Fokou with the Colts was a brief one, just like it was for Donnie Avery and Drew Stanton. Fokou has departed the Colts through unrestricted free agency for Tennessee. Fokou joined the Colts last year in a trade from Philadelphia during training camp, the team that had drafted him in the seventh round in 2009. 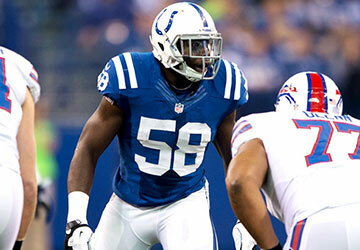 Fokou started one-of-16 games with the Colts, playing as a reserve linebacker and special teamer. Fokou opened at the MIKE position at New England in his only start, and he had 46 tackles, 34 solo, and one sack for the season. Fokou had defensive stops in 12 different games, with seven at Detroit being his top total. He had a fourth-quarter sack of Aaron Rodgers as the Colts overcame a 21-3 deficit in a 30-27 victory. Fokou was among the club leaders with five special teams stops. He is a veteran of 59 career games.